Everyone remembers the first time they tried a pre-workout supplement, that incredible surge in energy, focus, and the feeling that anything is possible. But not all pre-workout supplements are created equal, and for many people it is very difficult to tell a good pre-workout from a bad one. Considering how expensive some pre-workouts can be, this is a big deal! 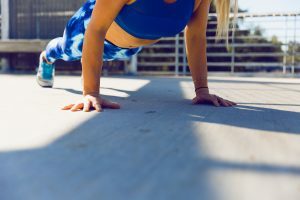 Luckily for you, the reader, this article will help you to discover exactly what to look for in a pre-workout supplement. Which ingredients are best, which ingredients you might want to avoid, and the different types of pre-workout supplement available. What Should a Good Pre-Workout Achieve? What is the purpose of a pre-workout? The most obvious purpose is to improve your performance in the gym. This can be achieved by reducing fatigue, improving focus, and increasing muscular endurance. But another purpose of a pre-workout is to help people who don’t want to train to get through those gym doors. If you’ve had a bad night’s sleep, or a long day at work, then going to the gym can sometimes feel like a chore. A good pre-workout can help energise you, motivate you, and get you excited to train. At the beginning of this article we mentioned that initial feeling of euphoria after taking a pre-workout. While that feeling does go away after a while, it can be very useful at first. A good pre-workout can also help to reduce fatigue. Not just the fatigue that comes with a lack of sleep or a long day at work. We’re talking about fatigue from training the day before. Ingredients such as caffeine can help reduce pain, which can lead to you training harder for longer, in spite of your aching muscles. There are two types of pre-workout supplements out there, and knowing the differences between the two is very important. Stimulatory pre-workouts are those that contain ingredients such as caffeine that can stimulate your central nervous system. As mentioned before, your body can build up a tolerance to them making them less and less effective the more you use them. People who train in the evenings may not want a stimulatory pre-workout as this can affect their sleep (caffeine can stay in your system keeping you alert for several hours after ingestion). Luckily there are non-stimulatory pre-workouts out there. These are designed to help you perform better, feel more energised, and help your focus without the use of stimulants. This often means that they are more creative with the ingredients used. It can also mean that they are not quite as effective (otherwise there would be zero need for stimulatory pre-workouts). One way to get the best of both worlds is to cycle between stimulatory and non-stimulatory pre-workouts. By cutting out stimulants such as caffeine for a period of between 2-12 weeks you can effectively re-set your caffeine tolerance. How long it takes can be affected by a whole range of factors (personal biology, how much caffeine you have on average, how long you have been consuming caffeine for etc). You could take a stim-free pre-workout for a few weeks while cutting your caffeine intake. This would work well if you based your training program around this cycle too. Once your tolerance is back up you could switch back to a stimulant and see a big difference to your performance in the gym. There are a number of good ingredients that you can have in a pre-workout. In this section we will take a brief look at four of them. This is not an exhaustive list by any means, but these are my favourites. Caffeine – The ultimate (in my personal opinion) pre-workout ingredient. You could have a pre-workout that was filled with absolute garbage, but supply enough caffeine and you’ll still get a fantastic workout! A look at the research tells us that for performance improvements you need to take quite a high dose. Caffeine intake should be based on your body weight, a 50kg person should not be taking the same amount of caffeine as a 100kg person, because it would effectively be twice as strong! 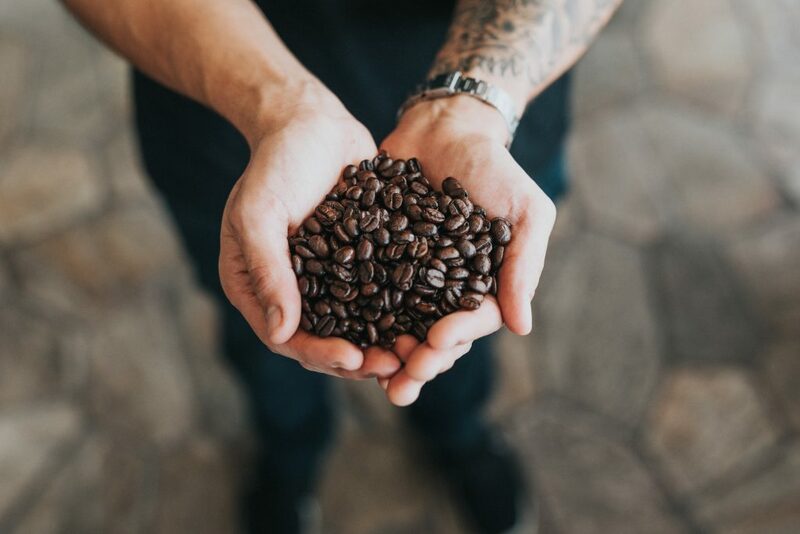 But for simplicity, 200-400mg of caffeine is usually the amount required for increased power/muscular endurance etc… The Mayo Clinic recommends no more than 400mg of caffeine a day for safety, however, so be sure to watch your overall caffeine intake if you’re using a pre-workout that’s heavy on the caffeine. Of course, some people are very sensitive to caffeine or prefer to avoid it, so this isn’t a must for everyone. Arginine – Arginine is used to increase blood flow. It does this by boosting Nitric Oxide formation in the body. The more blood flow you have during a workout, the more nutrients are delivered to the muscles. This can help boost protein synthesis and lead to bigger and stronger muscles (at least theoretically). Alternatively, you can use Citrulline which converts to Arginine in the body, in fact it may even be a more effective method of boosting Arginine than actually taking Arginine! Beta-Alanine – If you’ve ever felt a tingling sensation in your fingers after consuming a pre-workout then you can thank Beta-Alanine. Don’t worry, this feeling is completely harmless. Beta-Alanine does have a lot of uses though. 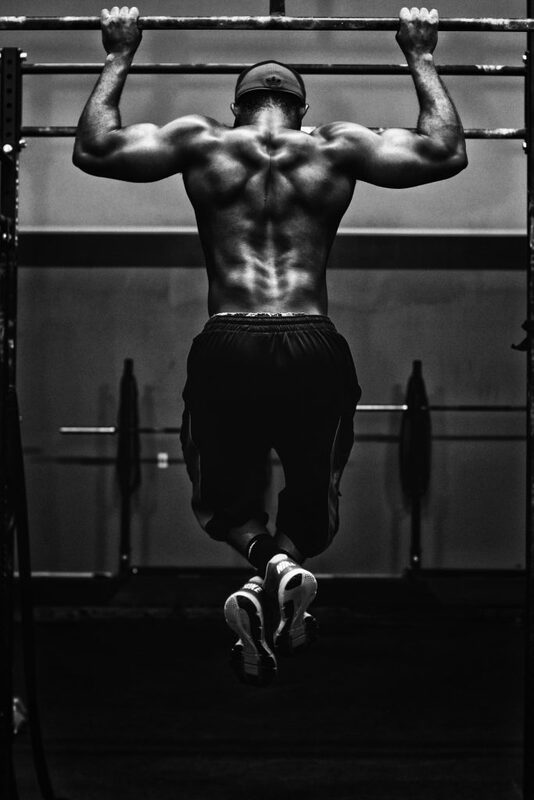 Studies have found that Beta-Alanine can increase muscular endurance as well as reducing fatigue. These are two very important requirements for a high-quality workout. Branched-Chain Amino Acids (BCAAs) – BCAAs have got quite a bad rep over the last few years, with many fitness experts (correctly) pointing out that provided your protein intake is sufficient you will not need to supplement with BCAAs for muscle growth. But as a pre-workout ingredient, BCAAs have a lot of uses. They can reduce fatigue, stimulate protein synthesis, and improve your endurance. They may also reduce your rate of perceived exertion (RPE) and help you to focus better. If you know your stuff then you may be a little surprised that we have not mentioned creatine monohydrate yet. It is undoubtably one of the absolute best supplements out there. So what gives? Well first off, creatine has been shown to be more effective when taken post-workout. Secondly, creatine tends to work best when it is loaded (consuming higher doses for the first couple of weeks before tapering off). This is something that can’t be done if you are taking a pre-workout with a pre-determined dosage of creatine. Thirdly, creatine and caffeine tend to cancel each other out. A 1996 study in the Journal of Applied Physiology found that “caffeine counteracts the ergogenic action of muscle creatine”. This would be like turning the hot and cold taps on equally and ending up with a tepid bath rather than a hot or cold one. Basically, you should take creatine monohydrate. But ideally you should take it post-workout, and separately so that you can get the correct dosage. You should also avoid combining it with caffeine. These two ingredients are way too important to mess around with! That said, the inclusion of creatine monohydrate in a top notch ready-made pre-workout stack can help to give you a little boost to your gym work… it just won’t be as effective as it could be if loaded or taken as suggested above. Doses of 1g or more, however, ideally in Creapure form, might be enough for what you need. Optimum Nutrition's Micronized Creatine is a Creapure product, the highest quality creatine powder available. Purity close to Creapure, quick to absorb, excellent value without any need for compromise. The big thing to avoid when looking at pre-workouts is any supplement that uses a proprietary blend. A proprietary blend is basically a sneaky way for supplement companies to hide the dosages of each ingredient. For example, let’s say that you bought a pre-workout that contained caffeine, beta-alanine, and arginine. It would be useful to know how much caffeine was in each serving (particularly if you are quite light and don’t want to over-indulge). On a normal supplement it would say how much caffeine was in each serving, how much beta-alanine, and how much arginine. But a proprietary blend would just give the weight of all the ingredients without saying how much of each was in the product. So, it could say 500mg overall weight, but it wouldn’t say whether there was 1mg or 400mg of caffeine per serving. It’s pretty dodgy, and there is no real reason why a supplement company would need to do that. Avoid! A non-stimulatory pre-workout should be taken right before a workout for it to be at its most effective. The ingredients will often work instantaneously. However, a pre-workout that contains caffeine should be taken around 30 minutes before a workout. A 2002 study by Cox et al found that caffeine taken 60 minutes before a workout was most effective . But remember that you don’t just walk straight into the gym and train at 100%. There are warm-ups, possibly some foam-rolling, and setting up your equipment. You want the caffeine to kick in just as you are performing your first working set (a set where you are using a challenging weight rather than a warm-up set). Taking your pre-workout in the car park outside the gym, or just as you walk into the changing room seems like the best time to do so. So, there you have it, you should know now that pre-workouts can be split into two groups and that both have their place. You should be able to identify which ingredients to look for, and which to avoid. You should also know when to take your pre-workout so that it is at its most effective. Why not check out our recommendations for the Best Pre-Workouts to Buy in the UK in 2019 below? You can use your new-found knowledge to make the best decision for your personal needs. 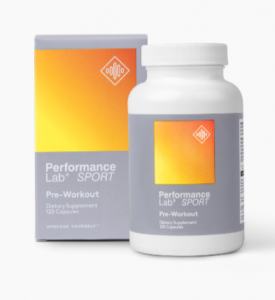 From the impressive all-natural Peformance Lab range from Opti Nutra comes Performance Lab SPORT Pre-Workout, a clean supplement that pledges to improve muscle growth, aid endurance, boost focus, energy and strength, and improve your exercise performance. Stimulant-free, as well as GMO, vegan, gluten and soy-free, it combines effective pre-workout ingredients such as creatine (1g included in the all-important Creapure form so still plenty useful in a pre-workout stack) and glutamine with L-citrulline (raises argenine levels) and L-Carnosine. Also includes promising new ingredients such as Maritime Bark Extract and Cordyceps Super. We love Performance Lab SPORT Pre-Workout for its clean, stimulant-free appeal and its commitment to looking after the health of your muscles as well as boosting your performance. Don’t let the in-your-face marketing fool you, however, because this really is one of the best pre-workouts around. It combines proven workout ingredients (1g creatine, Citrulline Dl-Malate, Acetyl L-Carnitine, caffeine) alongside nootropics L-Theanine (offset the caffeine jitters) and Rhodiola Rosea for motivation. Combined with red beet and coconut water powder for a nitric oxide boost and effective hydration. Should give you more power, more muscle, a laser-like focus, extend your stamina and endurance and feed the muscles with oxygen and nutrients while you train. What’s not to like? 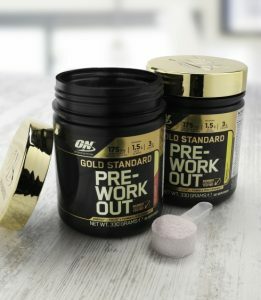 From one of the most prolific supplements companies around comes ON Gold Standard Pre-Workout, a top of the range supplement that uses pretty much all of the recommended ingredients we mentioned above. We’re talking creatine (a hefty 3g of Creapure), beta-alanine, L-Citrulline (raises arginine) and caffeine. Added to that is NALT and ALCAR, Panax Notoginseng (to potentially reduce muscle soreness), Citrus Bioflavonoids (potent antioxidants) and a variety of B vitamins. The amount of caffeine included is medium to low for a pre-workout (175mg) so it’s a good choice for those who want the focus and endurance of a pre-workout with a hit of energy BUT who don’t want to be up all night. A solid quality choice too for anyone new to pre-workouts. 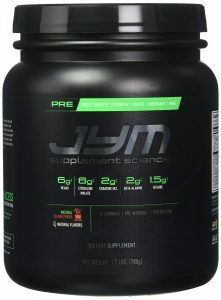 Jim Stoppani is the founder of the award-winning supplement company JYM Supplement Science and this pre-workout is one of their most popular products, very easy to buy in the UK. JYM Supplement Science has three strong rules about all its supplements: no proprietary blends, enough effective ingredients to work and correct dosages. Sounds like a basic premise, doesn’t it, but you’d be surprised how many other pre-workouts on the market fall short in one or more of these. Pre-JYM Pre-Workout promises to deliver supreme energy, create a hyper focus and enhance your workout. It does this via 6g of Citrulline Malate, 6g of BCAAs, 2g each of creatine and beta-alanine, alongside tyrosine, taurine, beet root extract, Choline Bitartrate, Alpha-Glyceryl Phosphoryl Choline, N-Acetyl L-Cysteine, BioPerine and 300mg of caffeine. Pre-JYM contains the highest caffeine content of all the pre-workouts on our list and unfortunately doesn’t include theanine to offset any side effects. It will provide a strong boost which many regular gym-goers and athletes will appreciate — no doubt partly why it gets such positive reviews. 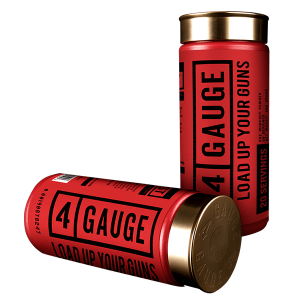 This is probably not a product for people with caffeine sensitivity, however, or anyone new to pre-workouts. Consider it a pre-workout to work up to instead. Matt Smith is a freelance fitness and nutrition writer. He has a degree in Sports Science from London Met University, and has seven years’ experience as a personal trainer and online coach.